A few Saturdays ago, I headed up American Fork Canyon in Utah to do a ski tour with my little guy. It was a blue bird day and the sun was out. We started our approach from the Tibble Fork Reservoir parking lot. In the winter, Tibble Fork Reservoir is a popular destination for snowmobilers, snowshoers, and sledders. The parking lot was full. I knew once we found a parking spot, it was going to be a good day. The Tibble Fork parking lot tends to be crowded on the weekends. The earlier you can get there the better. The warmth of the sun on the face is one of the great joys of skiing on a blue bird day. The sun warms your face and your soul. I put my little boy into a hiking backpack and we headed out for our ski tour. The goal of the ski tour was to get outside, breath the clear air, and get some exercise. Tibble Fork Reservoir is about 15 minutes from the mouth of American Fork Canyon. The canyon entrance is located between the cities of Cedar Hills and Alpine. It's accessible from I-15 by getting off the 284 Lehi exit and heading east down UT-92 E. The reservoir is beautiful year round and the views of the mountains that surround it are breath taking with Mount Timpanogos just to the south. We started our ski tour following the snowmobile tracks. My little guy kept saying, "Yeah Daddy!" For those that read my adventure blog, my goal is to inspire you to get out and explore the area where you live. I have found tons of happiness leaving the hustle of the city to go up to the mountains to enjoy the views and serenity they provide. Set a goal this week to spend some time outside. Netflix can wait! Trust me, it will bring great balance, energy, and happiness to your life. So what is ski touring? 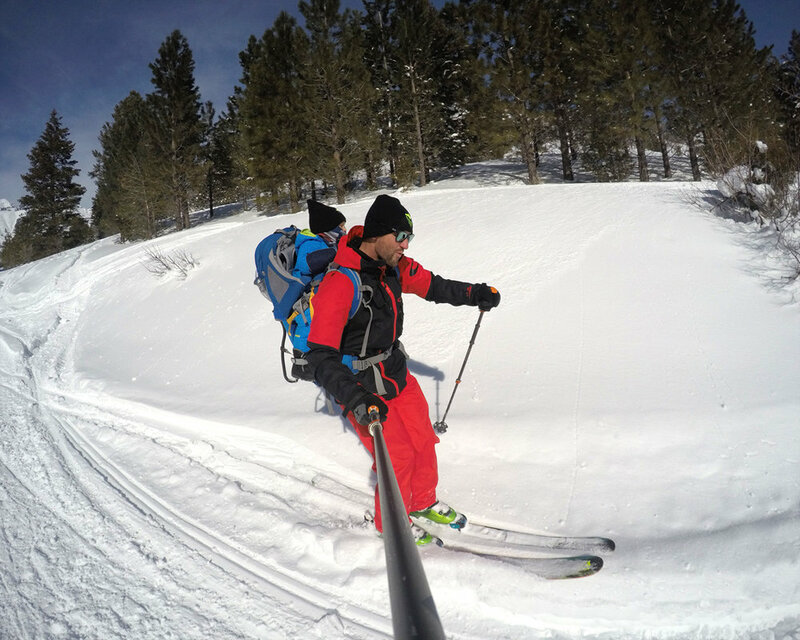 Ski touring is where you strap a pair of climbing skins (artificial horse hair like material) that stick to the bottom of your skis and climb up a mountain. Once at the top, you ski back down—it's awesome! The skis are mounted with touring bindings which allow you to use a walking motion on the way up and then the bindings click back into the ski when your ready to head down. 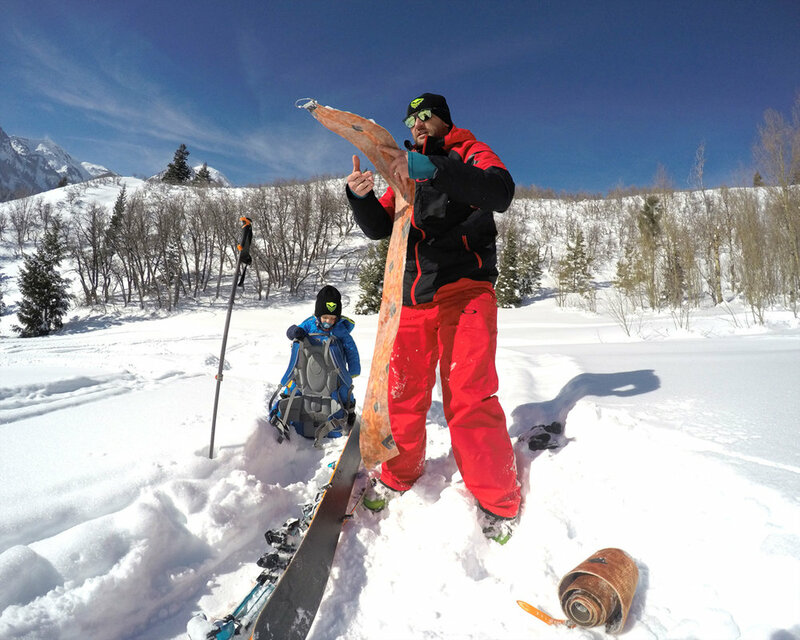 Ski touring in American Fork Canyon requires a bit of a climb to get to the mountain runs. Many of the ski touring trails in the Wasatch require less travel time to reach the vertical feet needed to have a nice run on the way down. My goal on that day was to get out with my little guy, enjoy the blue skies and sun, so American Fork Canyon was perfect for this day. About half way up our ski tour, I noticed my little Guy got quiet and then I heard a faint little snore. With the warm sun on his back and the steady motion, he had fallen asleep. Relaxing in the mountains under the warm winter sun will relax even the most stressed out people. As a Dad, this little ski tour adventure was pure joy. Passing on my passions to my children makes my happy and seeing them enjoy it makes me ecstatic. We arrived at the top of a flat meadow that had very little steepness. I took the skins off my skis and just hung out with my little guy. He is starting to speak, so we played the copycat word game where he would try to repeat the words I asked him to say. Ski touring has three things I love: the up, the moment spent on the top of the mountain, and skiing down. All three are fun! Once we had enjoyed the moment, I clicked my bindings into the skis and headed down the little meadow. My little guy, was saying, "Yeah, Yeah, Yeah!" on the way down. I have learned that it's the little things in life that make the biggest impact on our happiness. This was a day I will never forget. A day where the ski tour was small, but the happiness I felt was big. Here is my challenge, schedule some time to get outside with people you love. It will make you happy!